Ambushing in day or night is nice, though I think day is stronger simply because of the existence of Plague Stone. Stopping an opponent winning a story they thought they would take is also nice. Overall its a nice card, worth a look in a deck that wants night. This would be better as a Day effect (just to blow up Night cards), but Night is occasionally useful, more often as a buff to your dudes. 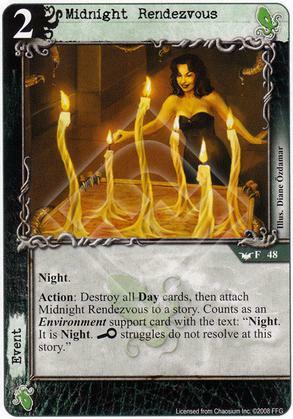 More important is the anti-investigation part of the card, which can be the tipping point between winning a story or not, and the Mythos factions generally have trouble with the icon anyways. I can see slotting 1 or 2 of these in a deck, but they'd likely be first on my "cards to potentially cut" list. Speed day is great, especially now that agency are popular where it could mean stripping combat icons and preventing willpower after characters have committed. Making a story safe from rush is really good when coming from a faction with so few investigation icons. I like this card.